Up We Go Again! – Run. Ride. Roam. 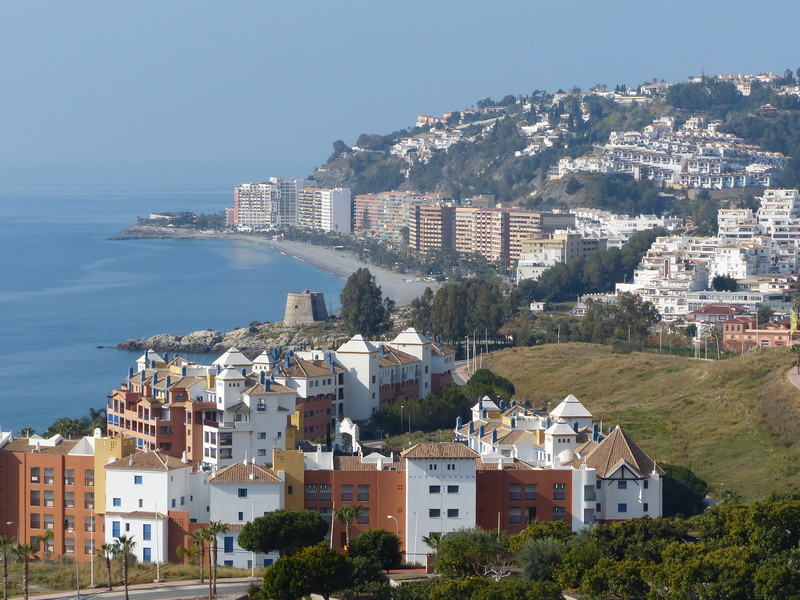 It was a beautiful morning to start the day in Almunecar. We left our nice little hostel and pedalled out of town along the nice flat esplanade by the water, the same one that I had run along yesterday. The weather forecast had been for showers and 16C so we rugged up and Steve put his leggings on, but it was a mild morning with no hint of a forecast like that. 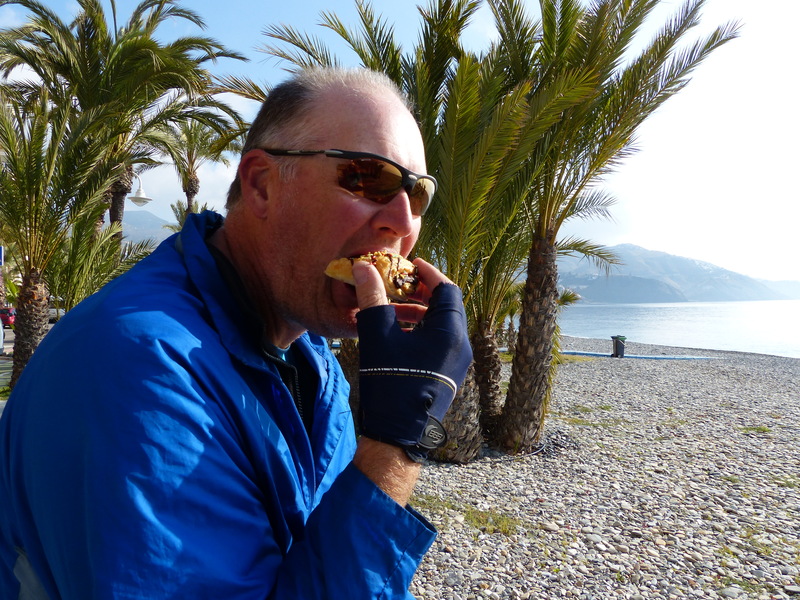 We stopped beside the beach for Steve to top up his pastry stores and then we headed out of town. The ride along the esplanade was lovely, looking out at the water, with the early morning haze sitting on it and the sun peeking through the trees. Up we climb and glance down at the town from only part way up the hill! Then we were on the main road and a long hill climb had us rising high above the town. The weather forecast was way off, because it was warm and the extra layers were proving decidedly unwanted as we ploughed up hill after hill. I had woken up with pretty tired quads after yesterday’s ride and then going for a run, so I was a bit surprised that I got up the hills without too much trouble and with some gears to spare. The views were gorgeous, looking down on the town and out to sea. We had planned a shorter ride today so we could arrive at our next campsite with some time up our sleeve for some housekeeping, so we were hoping things went to plan. As we rode along the main road, we had views of farmland and the water on our right and snow covered peaks on our left, so despite being on a fairly busy road, we had some interesting scenery. We rode into the city of Motril where we’d planned to get some bits and pieces to cook tonight, before continuing on the final 11km to our campsite. I had asked Steve what he fancied…Mexican, Indian, Moroccan, Italian or Chinese and I’d rustle up something along the lines of one of those cuisines, depending on what he chose. He chose Indian, so I rattled around in my brain to come up with something passable as an Indian style meal that would suit us both. 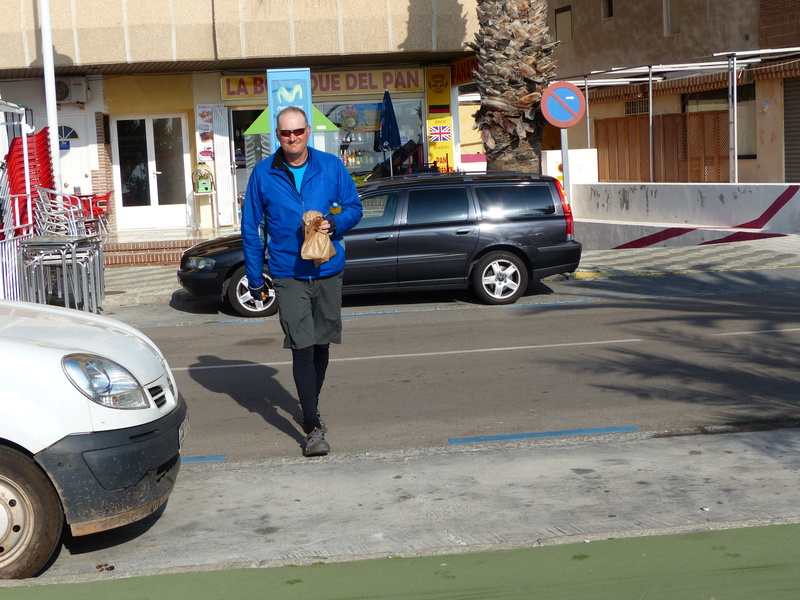 We stopped in a park for elevenses and then Steve relaxed and reclined in his chair in the sunshine, while I headed off to the supermercado to see what I could find to cook and to get some supplies requested by Steve. The result was I spent way too much time faffing about in supermarkets, which I find really frustrating. The whole food shopping game has been really challenging here. If you want to eat cake, pastries, soft drink, chips and processed food, you’re all set because there’s all manner of choice for those things. If you want to eat something remotely healthy, it’s a bit of a struggle. 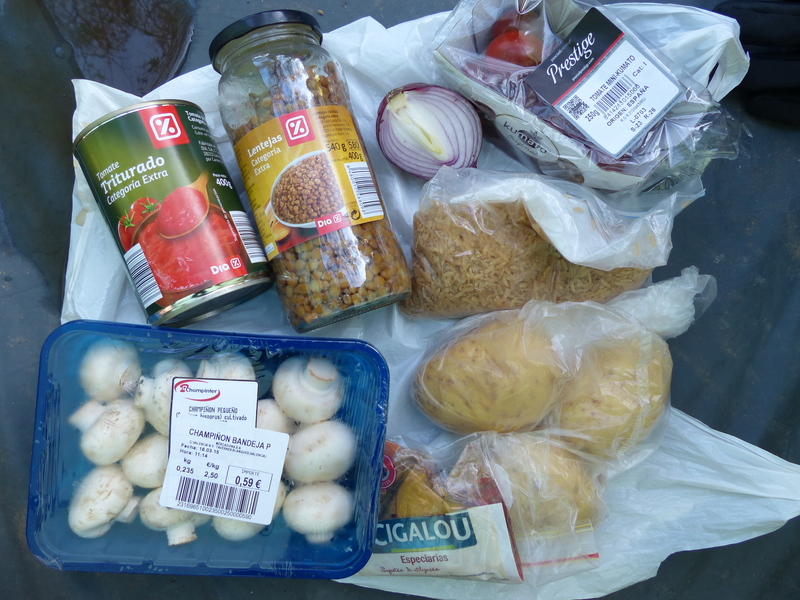 In Portugal the choice of produce and healthy food was pretty good, even in regular chain supermarkets, I didn’t even have any problem finding my rice milk in the regular supermarkets. Here though, the choice is really limited. It’s hard to find good fruit and veg and hard to find healthy food, so I power-walked the aisles of the Dio Supermercardo without much success with finding the necessary bits and pieces for the vegetable curry I was going to make. So it’s very much a matter of make-do with whatever can be found and get creative with the Trangia! 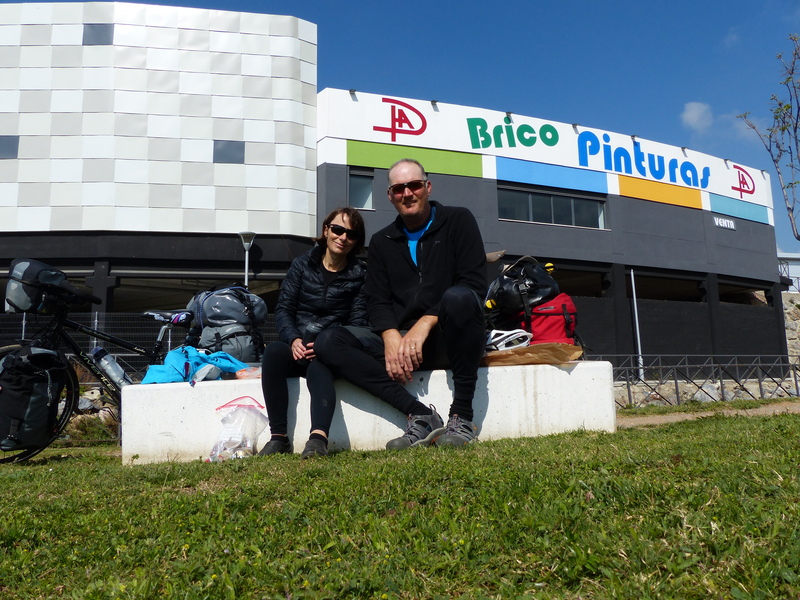 After limited success at the Dio, we pedalled off to the Mercadona Supermercardo, which wasn’t great but was a slight improvement on the last one, so I was able to get some more bits and pieces, but still with lots of holes in the grocery list. I did go overboard and buy some fruit though, because it’s been so hard to find, that when I found some bananas, pineapple, strawberries and apples, plus some things that could make a small salad, I couldn’t leave them there, so I stocked up and then we had to get creative with how to carry them back on the bikes. Problem solved…just tie the bags to the back and off we go! 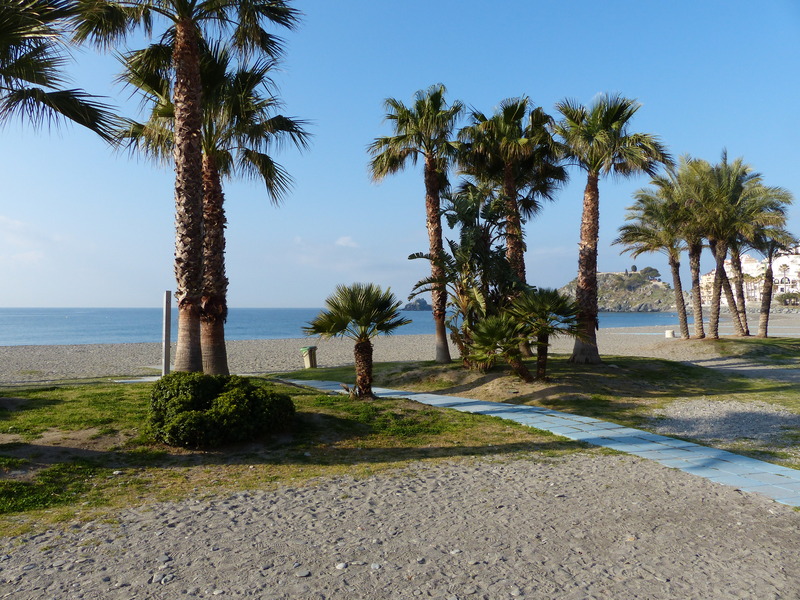 We pedalled out of Motril and as we did, I went down a bit of a bump in the bike path, not a huge one, but a bit of a bump. Straight away I could feel the bike doing what it had done yesterday. Things weren’t right. The scraping noise was back, it wouldn’t free-wheel down a hill, in fact I didn’t have to use my brakes at all because there was so much resistance coming from somewhere that the bike was holding itself back. I bet you’ll never guess what was on the edge of town though. Can you guess? What do you reckon? A hill, I hear you say? Yep, bang on the money! Just when the bike decided to go a bit cactus again, I had to climb a hill with the feeling of climbing with my brakes on! Oh well, nothing to be done about it, we had 5km to go, so let’s just get it done! Up I went…puff…pant…gasp…that warm day had really turned on a corker and it was hot work riding a bike that didn’t want to move, up a hill. Push…stroke…puff…the easier feeling I’d had earlier in the day was gone and the tired quads were now making themselves known because they were working overtime, getting that busted bike up those hills…gasp…puff…I couldn’t see where I was going, the mixture of salty sweat and melting sunscreen were stinging my eyes, I’d close one eye to get some relief and the other one would sting, so I’d switch eyes…on the hill went…on I went riding with one eye and a busted bike! 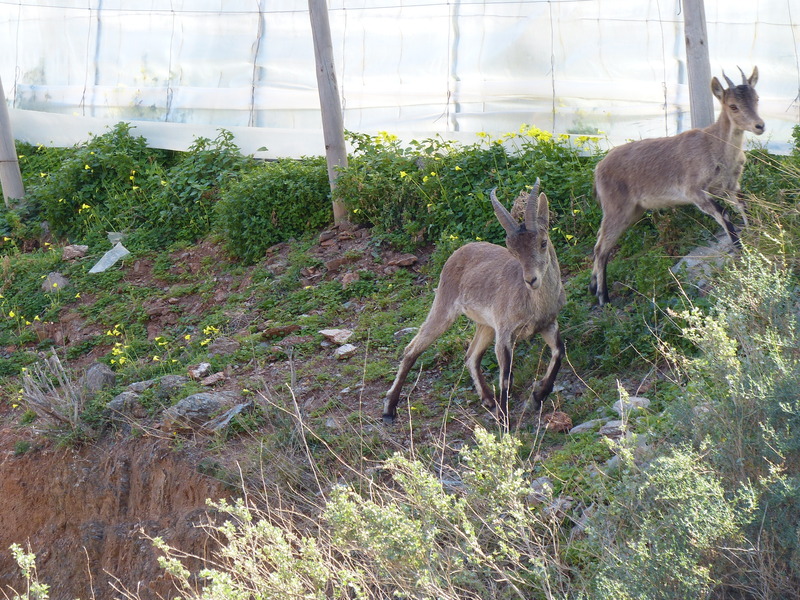 Eventually the hill levelled out and I could stop for a breather and there I saw a group of goats, right there on the bank beside the main road. They were skipping and running and larking about up that bank as if they were skittering through a meadow, so sure footed were they. If only hills could be so easy and playful for the two-wheelers! We eventually arrived at the campsite after a mere 37km of riding and it’s a nice enough place. We held off pitching the tent while we wolfed down some lunch. I had found a bag of lettuce and some tomatoes and some cucumber at the supermarket, so I rustled together a pretty meagre salad but I wanted to inhale it I can tell you! A limp bit of iceberg never looked so good! Salads have been few and far between on this trip and when I can get one into me, it’s gone in a twinkling! Then, tent up, tea made and finished, clothes doing their sloshing in the washing machine, Steve set about looking at my bike. He spun the back wheel…nothing, it wouldn’t spin. I was kind of glad to see that because it meant I wasn’t imagining things and it meant the tough riding and the struggle up the last lot of hills weren’t just me, there was definitely something wrong with the bike. Then he discovered a bolt was missing on the back wheel. Had that come undone with the bumps I’d had to ride down lately? Without that bolt the weight of the back bags could have been pushing down on the mudguard. Apart from the bolt, some closer inspection revealed something possibly caught in the disc brakes too, so Steve worked his mechanical magic and pulled things apart and put things back together and things seem to be OK again. At least the wheel spins and the brakes still seem to work. Here’s hoping that’s the end to it! As I said, the campsite we’re in is pretty nice, but I’m intrigued by the prices of accommodation. Last night our nice private room at the hostel cost us 28Euro and tonight we’re paying only 6Euro less for a small patch of ground on which to put a tent. One of the nicest campsites we stayed at in Portugal, with it’s nice grounds, library, reading room, market and mini-gym was only 7.90 for the pitch. The first campsite we stayed at in Lisbon, in a very ordinary and icky feeling cabin was 40.00 a night and our nice hotel in Faro was 37.00 and the really nice hotel in Seville was only 45.00. So the prices don’t seem to match what you get for the price. So anyway, it was another day of some ups and downs and challenges but also a day of super scenery and terrific views. Oh…and those few meagre rations ended up blending into a pretty tasty and warming vegetable curry on a chilly night! 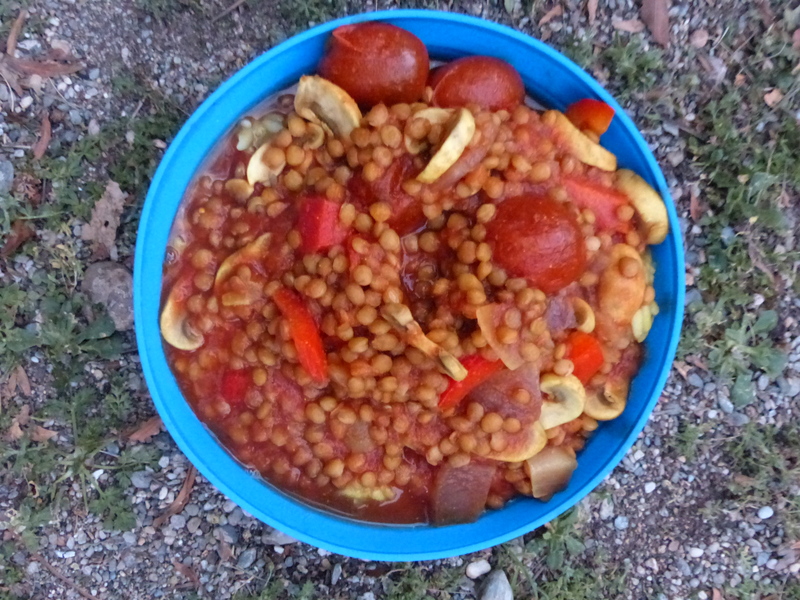 One of these days I’m going to post some of my “travellers’ recipes” that I create on minimal ingredients and cook pretty quickly and simply on nothing more than a Trangia. Watch this space for some campsite culinary creations! …we had a pretty hearty and tasty vegetable curry. I’m not sure where we’re heading tomorrow, we’re still to plot our course, but it will be somewhere east. Steve has suggested we stay in a cabin somewhere for the next couple of days because the weather is supposed to crack up a bit, so we might hunker down inside solid walls and ride it out. With a strengthened appreciation for the simple things in life, here is what I would like tomorrow, the day we mark a month of cycle touring… 1. A bike that behaves itself and doesn’t have a tanty at the first sign of a bump. 2. Some nice flat roads please. 3. A sunny day with no wind thank you very much. 4. A bit of nice bread and a thick spreading of peanut butter will be perfect thank you. 5. A cup of tea That’s all, thank you very much indeed. It’s was tough going! The “what I would like list” is up the creek today…blowing a gale and can’t go anywhere! Oh well, there’s always tea and peanut butter!